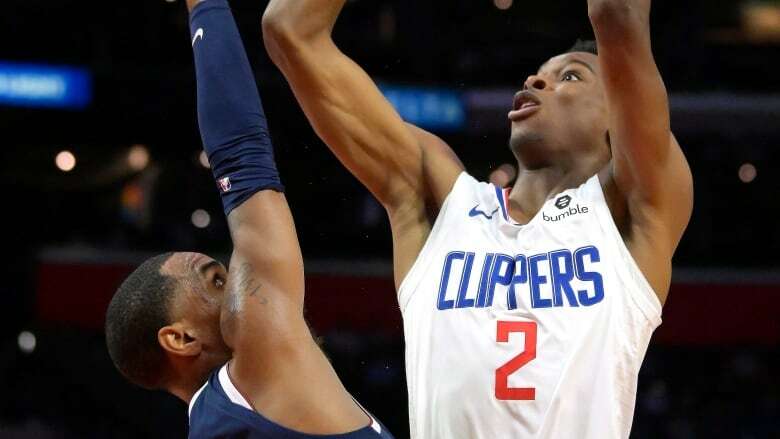 In the Los Angeles Clippers' final pre-season game against Maccabi Haifa last week, Hamilton's Shai Gilgeous-Alexander drove to the hoop from halfcourt before muscling through two opponents for an emphatic dunk. The 20-year-old rookie calls it the highlight of his young NBA career thus far. In the Los Angeles Clippers' final pre-season game against Maccabi Haifa last week, Shai Gilgeous-Alexander drove to the hoop from halfcourt before muscling through two opponents for an emphatic dunk. The 20-year-old rookie from Hamilton calls it the highlight of his young NBA career thus far. It's also indicative of the steely nerves the Canadian has shown. The NBA's bright lights haven't fazed Gilgeous-Alexander at all. "I'm just really confident in my abilities and how hard I work," Gilgeous-Alexander said from L.A., before practice on Monday. "When you put in the hard work, things pay off. I will say the first game I had a little bit of nerves just because it was my first NBA game, but it was a good experience to get past. I'm just confident in my abilities." The Clippers guard will be one of 13 Canadians on NBA rosters when the regular season tips off on Tuesday, and based on his pre-season performance, and the praise he's earned from Clippers head coach Doc Rivers, the Kentucky product could be one of the most intriguing storylines of the season. Gilgeous-Alexander averaged 9.2 points and 3.8 assists through five pre-season games. He was voted the "Steal of the draft" at No. 11 in the recent poll of NBA general managers. And Rivers has had numerous kind words about the Canadian. "His vision, his size, his competitiveness, he's got a chance to be a really special player," the coach told reporters recently. "He's not going to be special tomorrow, but he may be special soon, and he has it in him, there's no doubt." At 6-6, Gilgeous-Alexander has excellent height for a guard, and has a huge seven-foot wingspan to go with it. "I don't know if you can attack him," Rivers said. "Honestly, he's too long, too athletic. What I love about him offensively is you've got Avery Bradley and Pat Beverley guarding you every day in practice, and it doesn't affect him at all. He's just so big that it has no impact on him." Kenold Knight has coached and mentored Gilgeous-Alexander through AAU basketball since he showed up for a camp in Hamilton in Grade 8. "Big huge feet, skinny," Knight said of his first impressions. "He had some really good instincts, and with the attributes in his body, he just looked like he could be a basketball player." said Knight, who's an assistant coach with the McMaster Marauders. Knight, who accompanied the player out onto the stage on draft night in Brooklyn, wasn't surprised to see Gilgeous-Alexander fit into the Clippers so seamlessly. "Shai has just worked extremely hard and put himself in a good position. The thing about him is he's such a good student and really wants to learn the game, and kind of soaks up everything, and from there you just see the potential and see what he can be because of the fact that he just wants to work," Knight said. "That's why I think Doc kind of hit the nail on the head, he will be special because the kid just works extremely hard, I think anybody who works that hard at anything is going to be really good at it." Gilgeous-Alexander said he feels "blessed to have an opportunity to learn" both from Rivers and other Clippers coaches, including Sam Cassell. He singled out veteran guard Lou Williams as a player who's taken him under his proverbial wing. "Lou helps me a lot in terms of offensively especially, reading defences, picking spots, and things like that, and he's obviously a great scorer," Gilgeous-Alexander said. Rivers is famously stingy with playing time for rookies, but Gilgeous-Alexander, who started on the bench for Kentucky but quickly worked himself into the starting lineup, could be the exception. "I feel like if you prove yourself, and you deserve to play, he's going to play you," Gilgeous-Alexander said. "He's just competitive and wants to do what's best for the team at all times." The young Canadian said he's settling into L.A., and that little about the league has taken him by surprise so far. He talks to younger brother Thomasi, a promising player who's in a prep program in Florida, and his mom on an almost-daily basis. "She asks me motherly things: How am I doing? What am I eating? Where am I spending my money?" said Gilgeous-Alexander, who will earn about US$3.4 million this season. The obvious clothes horse — his flashy floral suit was the fashion hit of draft night — admitted he's definitely added to his wardrobe since he signed his first NBA deal. The Clippers host the Denver Nuggets on Wednesday. Canada's other NBA players on opening night rosters are: Khem Birch, Montreal, Orlando Magic; Chris Boucher, Montreal, Toronto Raptors (two-way contract); Dillon Brooks, Mississauga, Ont., Memphis Grizzlies; Cory Joseph, Pickering, Ont., Indiana Pacers; Trey Lyles, Saskatoon, Denver Nuggets; Naz Mitrou-Long, Mississauga, Ont., Utah Jazz (two-way contract); Jamal Murray, Kitchener, Ont., Denver; Kelly Olynyk, Kamloops, B.C., Miami Heat; Dwight Powell, Toronto, Dallas Mavericks; Nik Stauskas, Mississauga, Portland Trail Blazers; Tristan Thompson, Brampton, Ont., Cleveland Cavaliers; and Andrew Wiggins, Vaughan, Ont., Minnesota Timberwolves.